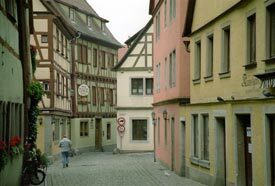 ABOVE: A street in Rothenburg ob der Tauber. Travel writer Lee Foster suggests making Rothenburg your base for touring Augsburg, Würzburg, and points in between. You may recognize this text if you've watched the guidebook author's PBS television show or travel videos. Our 58 photos are accompanied by captions.